Mass : ~4.0 × 1010 kg. Sidereal Rotation : ? hr. Mean Sidereal Rotation : ? hr. 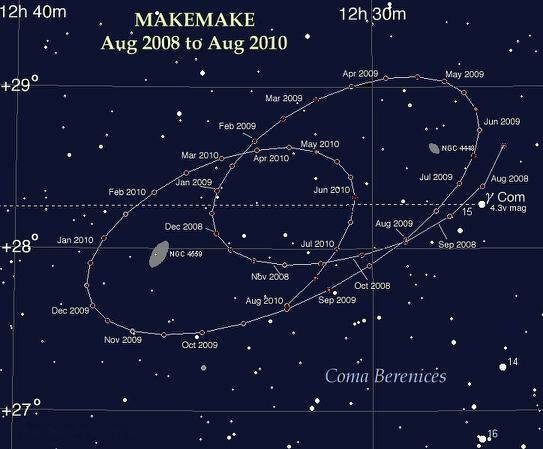 M A K E M A K E, pronounced maki-maki, is a newly listed dwarf planet (2008) that was formerly known as 2005 FY9 / 2005 FY9 (136472). As the fourth listed dwarf planet, the small body now joins; Pluto, Ceres and Eris. Makemake is sometimes called a Classical KBO’s or referred as cubewanos, by sharing the same region of the Solar System with the similar plutinos. Classical KBO’s are typically 2:3 Neptune resonant KBO’s with significant size, but if so, they are unrelated to the plutons. Makemake is an unusually bright trans-Neptunian body, and lies at the mean distance of 45.5 AU, which varies between 38.2 and 52.7 AU. The orbital period of Makemake is 306.17±0.003years, being comparable to Pluto’s orbit but 58.35 years longer. Orbital eccentricity is 0.1611, and is moderate to high in inclination by 29.0° to the ecliptic. This means Makemake can significantly stray away from the zodiac, and as presently, this dwarf planet lies in the northern constellation of Coma Berenices among the galaxy fields at the declination of about +28° (2008).